Theatre Practitioner and freelance producer Lauren Hussein has worked with Powys Dance since 2016, successfully taking Flying Atoms into Powys schools and enabling it to take flight into the world of professional touring – see Flying Atoms in theatres across Wales this Autumn! Last weekend she attended the Greenwich & Docklands International Festival of Outdoor Arts with a bursary from Articulture, in her own words read how this trip has inspired her thinking and ideas about outdoor performance. My parents took me to Covent Gardens regularly as a child to see the street performers. Growing up in London, seeing performance and art in public places was fairly normal. However, this weekend I was watching not only as a spectator but as a maker too. 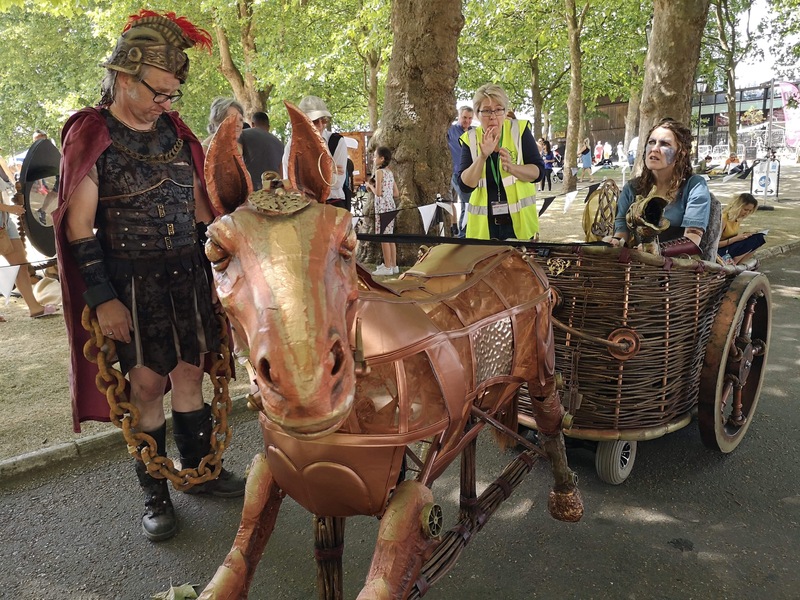 Being able to see the amount and variety of outdoor arts on offer at Greenwich & Docklands International Festival with making in mind was overwhelming and made the performances all the more impressive. Thanks to Articulture for making this trip possible. I want to highlight five key characteristics of outdoor arts that became clear to me this weekend, and that I’ll be taking forward in my producing role with Powys Dance. RoboPole presented by UliK Robotik was an example of precision and simplicity. A 10-minute performance displaying outstanding skill, making the audience gasp and turn to each other with raised eyebrows. The performer and robotic arm were perfectly in sync, and if I’m correct that it was all pre-programmed, the performer’s precision in standing at exactly the correct point over and again to interact with the machinery was so interesting to watch. Although the development must have been detailed and the subtext could be discussed for hours, the piece itself was simple and concise. An obvious trait but one that becomes all the more significant when you set out to make is that there is no backstage, there’s no hiding, everything is laid bare. Many companies make this a focus of their work. I loved to see this embraced by Helen Eastman Production’s Bicycle Boy, and Dip by Max Calaf Seve. In Bicycle Boy, we saw the wires and audience members provided the pedal power; seeing the way things work was at the heart of the show. The Dip soundtrack was made in collaboration with the audience. Words, crisp crunching and bottle popping looped as a backdrop to breathtaking trampolining. The skill in looking like you don’t know what you’re doing is immense. I was lucky enough to get some overalls and make my way into the big white tent for Plock! presented by Grensgeval. To start, I really was tricked into believing I was going to watch someone simply paint for 55 minutes. It wasn’t until I became aware of the most beautiful and subtle soundtrack, I realised that every movement, moment of eye contact and mark made on the paper was perfectly choreographed. When watching Doble Mandoble’s La Belle Escabelle, it wasn’t the final balancing on top of a step ladder by your neck spectacle that was most impressive to me (although that was pretty jaw dropping!). It was the timing and skill required to make their intricate bottle and glass choreography look chaotic and wild. Connection between the performance and audience is what many artists aim towards. However, this weekend, I realised again how this is dependent on the spectator’s subjectivity not only the quality of the work. Teatro So’s Sorriso’s was indisputably beautiful and faultless but I failed to connect emotionally (despite trying!). I saw in the characters’ interactions one last dance with life and when the male figure took the largest balloon I imagined it floating to the heavens. But he popped it and I realised that what I saw was not what was intended and my connection with the piece was lost. Conversely, a scratch performance by Flintlock Theatre at the HUB called Last Words wasn’t based on a subject I felt instantly connected with. However, the skill of the single performer in storytelling and including the audience, particularly through her eye contact made the work touching and compelling. This is probably best exemplified in the piece that I found myself thinking about for most of the long journey back to Wales. Rodadoras presented by Becky Namgauds could have been performed inside in terms of scale and production. Three dancers performing powerful and primal choreography in soil didn’t have to be under a tree in the corner of the gardens. So why should it be? Firstly, being situated outside added to the artistic vision. The organic movement coming from the earth amongst nature and against the backdrop of the sky heightened the performance, making it so much more interesting that had it been performed in a pristine black box with professional lighting and surround sound. Secondly and most importantly for me, there were people who saw that work that would not have seen it had it been performed at Sadlers Wells. The deliveroo cyclists that stopped to watch at the fence, the toddler who paused puzzled at the women kicking the soil and the little girl in the front row ‘face timing’ her dad to show him what he was missing. None of this would have been possible in a venue and that’s what its all about.